← A Cook to Jhoom! Recipe published in The Guardian as the winning recipe! Many of you already know – I won! Wow! I was simply overwhelmed. I really had no idea. I’m not just saying that – I mean it! There were so many reasons – one being that my judging interview had gone so badly. In fact, I left the interview and the first thing I texted Jeremy was “I was rubbish!” I really hadn’t felt it went well. So, when I went up to accept the award – I was hugely overwhelmed – and somewhat ill-prepared with my speech! Take a look! So, as you can see, I didn’t say everything I wanted to. So here is the speech that I would have liked to say – had I been prepared for it!! “I am so happy to have won this award for so many reasons. Just Jhoom! has been my life for the last three years – and this is a huge acknowledgement for all the hard work and dedication that has gone into making it what it is today. The Just Jhoom! Dance Group who performed this evening are a small, but important part of what we do. They are the glitzy, glamorous part! Behind the scenes we have a team of hardworking, dedicated people from the Managing Director Neena Vivash, admin and support staff, trainers, mentors – and of course my partner in crime Beccy Matthews who has worked tirelessly with me from the beginning. And then there are the Just Jhoom! Instructors. They are so important to Just Jhoom! They go out there day in, day out teaching classes – sometimes to 2 people, sometimes to 20 – dedicated professionals – changing people’s lives. We live in a society that has an increasing problem with obesity, mental health issues, heart disease – and we strongly believe in the message that exercising will help people lead healthier lifestyles. And that’s where Just Jhoom! comes in. We want to get people moving – get them Jhooming – we want to change the lives of children in schools, adults in the community, and older people in care homes. We couldn’t do this without our instructors. So, to all the Just Jhoom! Instructors and the Team – a huge Jhooming Thank you! To all our business partners and supporters – Thank You for believing in Just Jhoom! And to all the Jhoomers who attend classes, workshops and support us – Keep Jhooming! Thank you to all my family and friends who have supported me and listened to me as all I do is talk about Just Jhoom! You have been very patient. 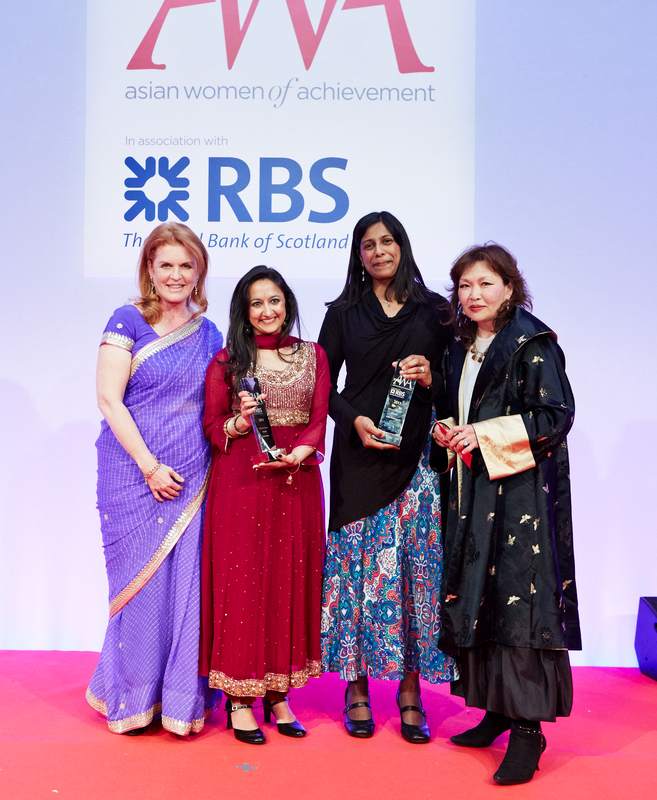 RBS, AWA and Pinky Lilani – Thank You for the recognition. Getting the award for Arts & Culture is so personal and poignant to me. At last I can tell my mother that dance is a an OK career choice for the “good Indian girl” – and if awards like this can motivate and inspire other young people to go into the Arts, whether that be dance, music, visual arts – tough, yet hugely rewarding career paths – then you really can’t ask for anymore! I’m sure I’ve forgotten someone – and if I have – please forgive me! So, it was a fab night. I still am on cloud nine! I saw one of the judges after I got the award – Jean Sharp, Chief Tax Officer at Aviva – who had been particularly tough in her questioning – and told her I couldn’t believe I had won – and she was so lovely and complimentary. “Shalini is a great all-rounder. She has turned an art form into a very successful business and is making a huge contribution to bringing an Asian dance form to the wider community and to a full range of generations – from the very young to the elderly. Just Jhoom! – as we’ve seen already – is incredibly dynamic both in terms of the product itself and in terms of its audience participation. So, the interview wasn’t as bad as I thought! Sometimes you just have to have faith! Last, but definitely not least, THANK YOU all so much for all the texts, calls, Facebook messages, Tweets, emails that you have all sent me. I have simply been overwhelmed! It means so much to me that my success had made you happy – and to me that is truly special!